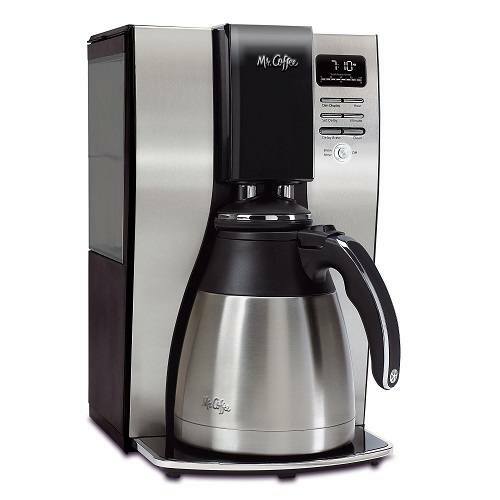 If you are always heading out for work in a rush, the Mr. Coffee Optimal Brew 10-Cup Thermal Coffeemaker System is probably the best option for you. This highly efficient coffee maker brews 10 cups of coffee in just under 7 minutes. Simply let the machine work its magic and you will be walking out with a piping hot cup of coffee in your hands. Additionally, the stainless steel thermal carafe will keep your favorite beverage warm for up till two hours. Water Filtration System: The inbuilt water filtration system removes up to 97% of chlorine for better tasting coffee. Timer: The Mr. Coffee Optimal Brew features a handy timer so you can enjoy a fresh cup of coffee as soon as you wake up in the morning. All you have to do is set the timer and voila. ​Grab-A-Cup Auto Pause: In a hurry and can’t wait for the whole put to brew? The Grab-A-Cup Auto Pause lets you stop the cycle when you need a cup of coffee. 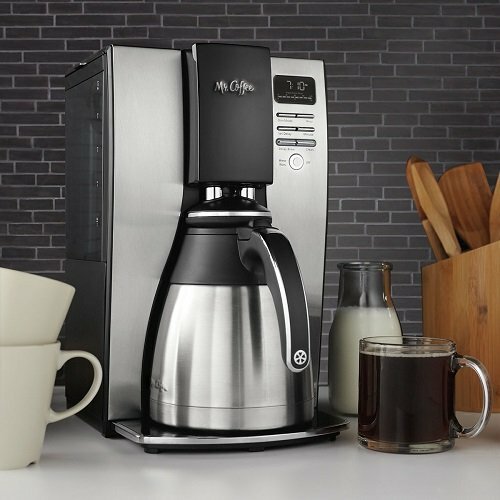 ​2-Hour Shut Off Feature: The Mr. Coffee Optimal Brew has an automatic 2-hour shutoff feature so you do not have to worry about shutting the coffee maker. ​Cleaning Cycle: The cleaning cycle alerts users for when it is time to clean up the machine. This results in better tasting coffee. 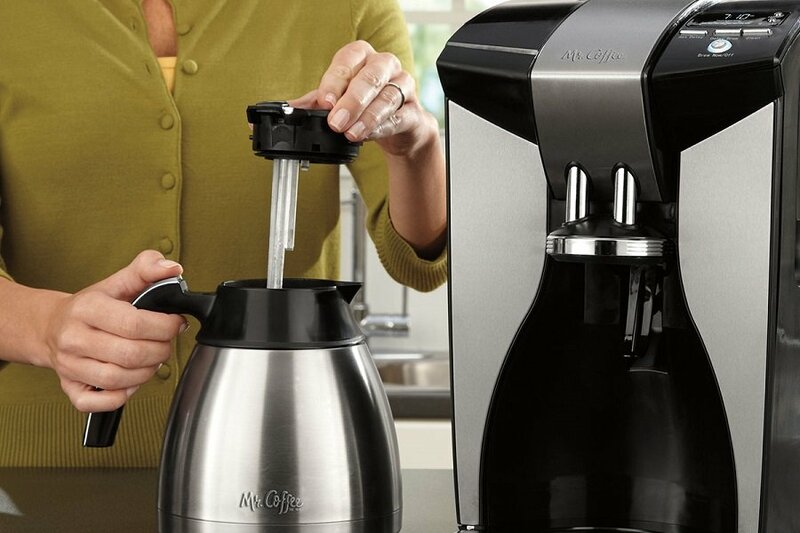 Removable Water Reservoir: The Mr. Coffee Optimal Brew features a removable water reservoir that results in easy filling and cleanup. 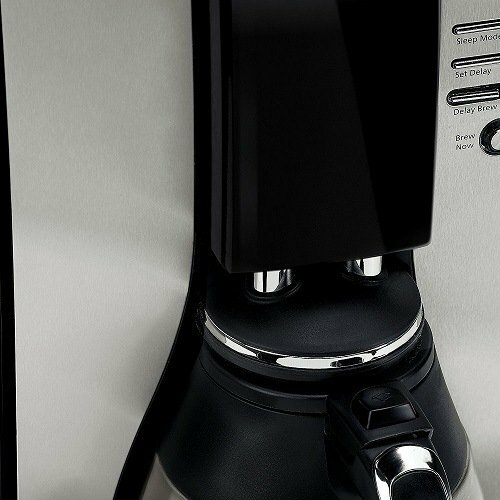 Quick Brew Time: The Mr. Coffee Optimal Brew has a quick brew time, which makes the coffee maker incredibly handy for people who are always in a rush in the morning. 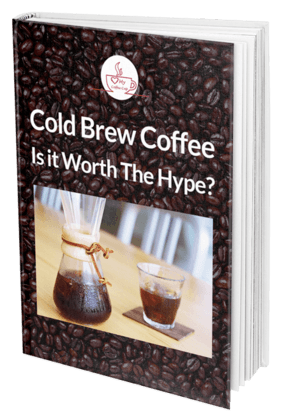 Keeps Coffee Warm: The coffee maker keeps coffee warm for 2 hours so you can enjoy a cup or more without worrying about it getting cold. ​Easy to Use: The controls are comparatively easy to use and do not have any complicated settings. Easy to Clean: The coffee maker is quite easy to clean but the carafe is not dishwasher safe. Carafe Not Dishwasher Safe: One minor con of the Mr. Coffee Optimal Brew is it is not dishwasher safe. However, this is not much of a problem as most manufacturers advise customers to wash the coffee maker by hand. The Mr. Coffee Optimal Brew can be bought on Amazon for $54.39 with free shipping. While the Mr. Coffee Optimal Brew has some minor flaws, it can drastically improve your coffee making experience if used properly. Follow the directions and with some practice, you will surely be able to make delicious cups of coffee with ease.